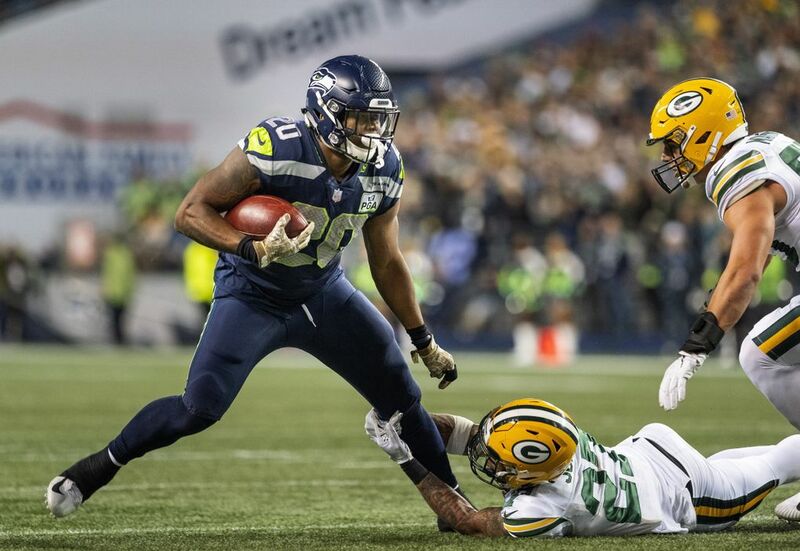 After taking the Rams down to the wire in Los Angeles, the Seahawks are looking to rebound on a short week against Aaron Rodgers and the Green Bay Packers. They're back under the lights at CenturyLink Field. Follow here for live updates, highlights and analysis. 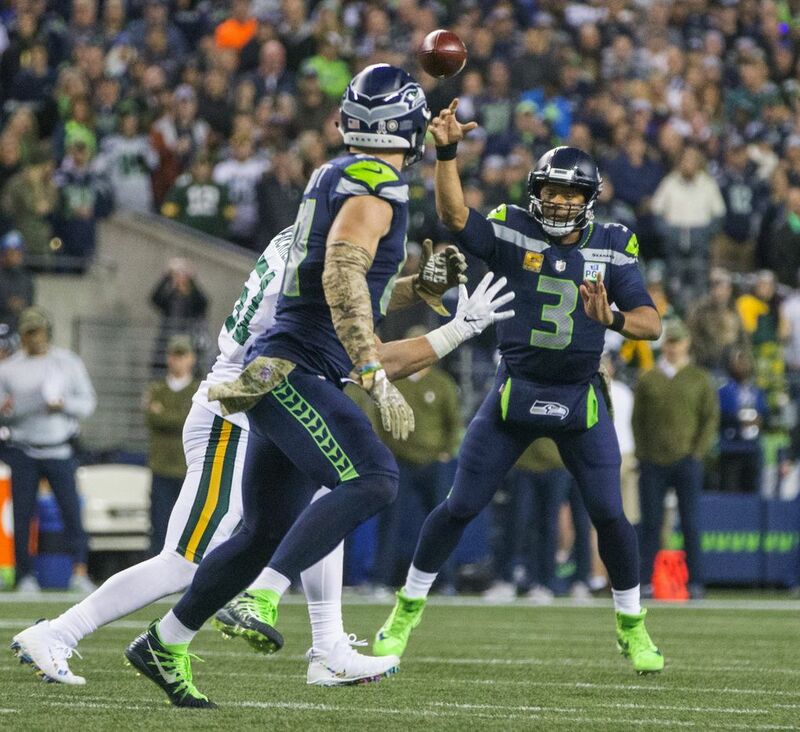 5:20 p.m. | CenturyLink Field | Seattle, Wash.
5:08 | Seahawks 27, Packers 24 Russell Wilson operates with precision to lead the Seahawks down the field and take the lead. 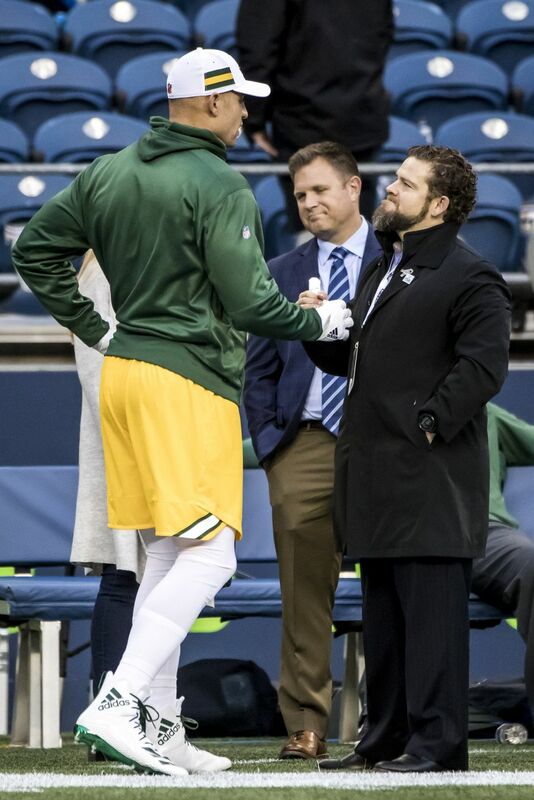 But did they leave Aaron Rodgers too much time? 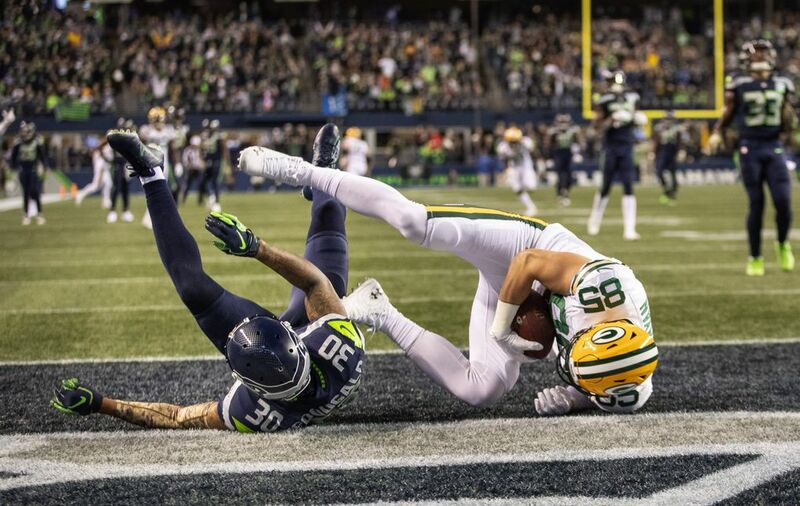 Jimmy Graham’s return to CenturyLink Field was limited. 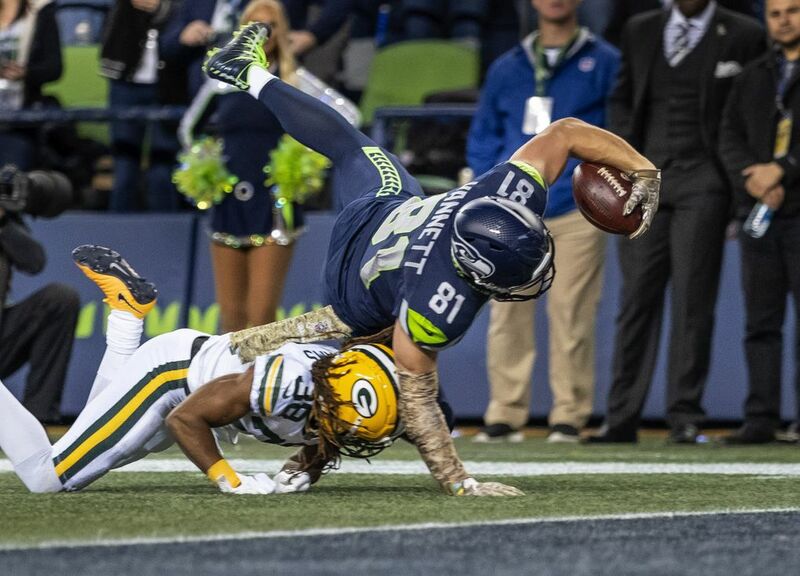 The former Seahawks tight end was officially ruled out of the game in early the fourth quarter with a thumb injury. Graham caught one pass for 13 yards on one target. So it was similar to some of his games during his time with Seattle. 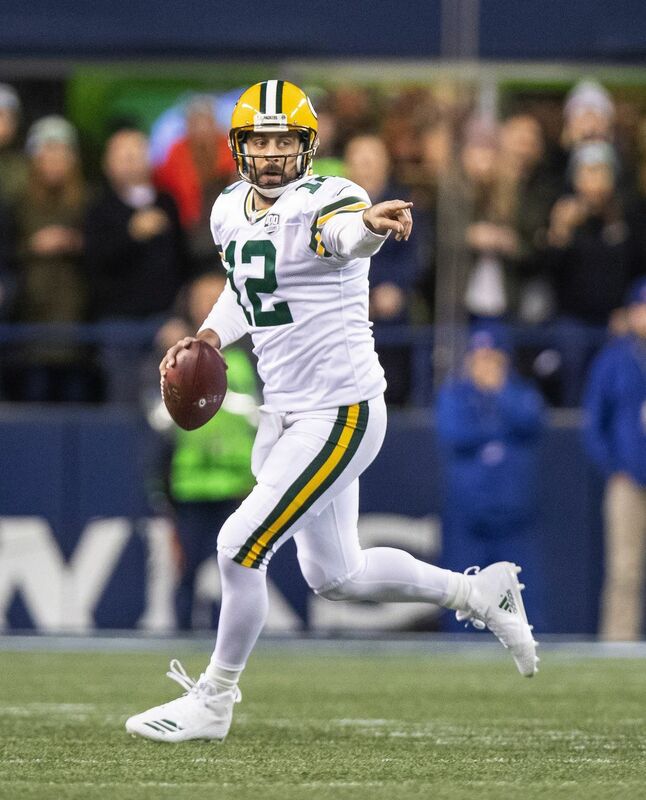 11:23 | Packers 24, Seahawks 20 Third-and-9 from the Green Bay 26, Aaron Rodgers uncorks a beauty of a pass downfield to the only man who looked remotely open. 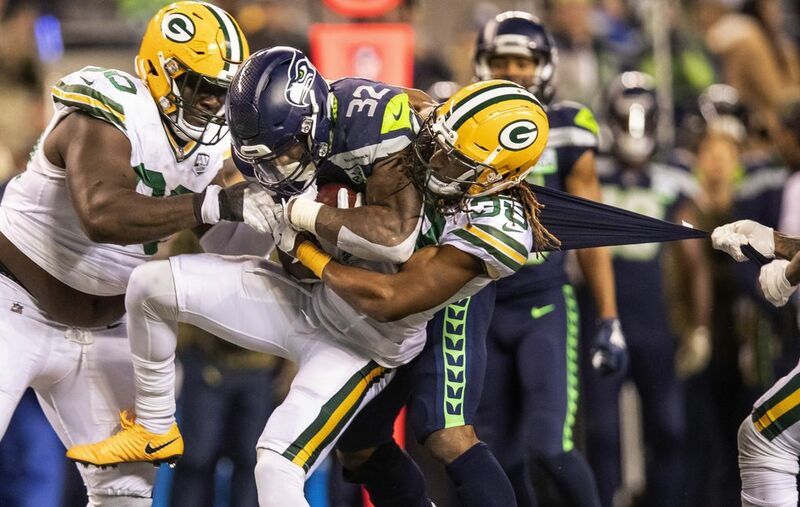 And even then, Davante Adams wasn’t all THAT open – Shaquill Griffin was right on him lockstep until the top of the route when Adams kicked up an extra gear, gained separation and pulled ina 57-yard reception. Adams has 10 receptions for 166 yards so far. 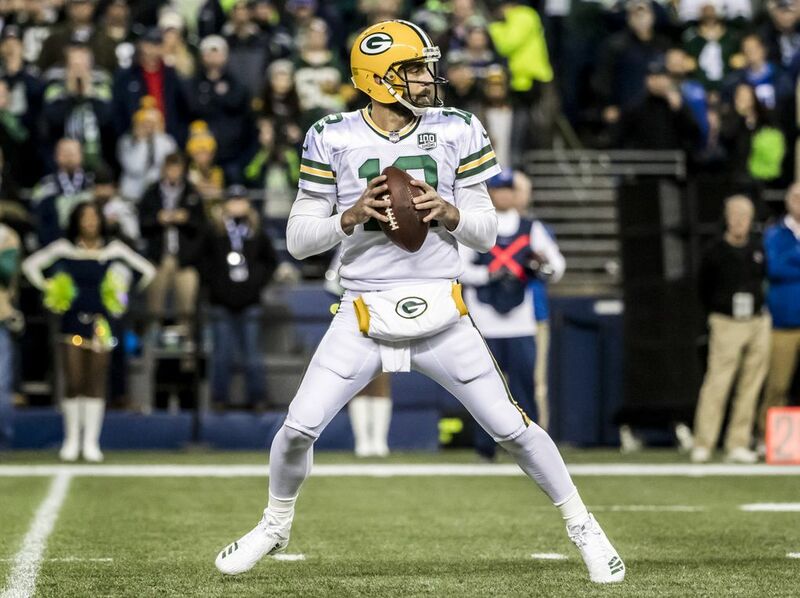 But Aaron Rodgers takes another sack, and the Seahawks hold Green Bay to a field goal. 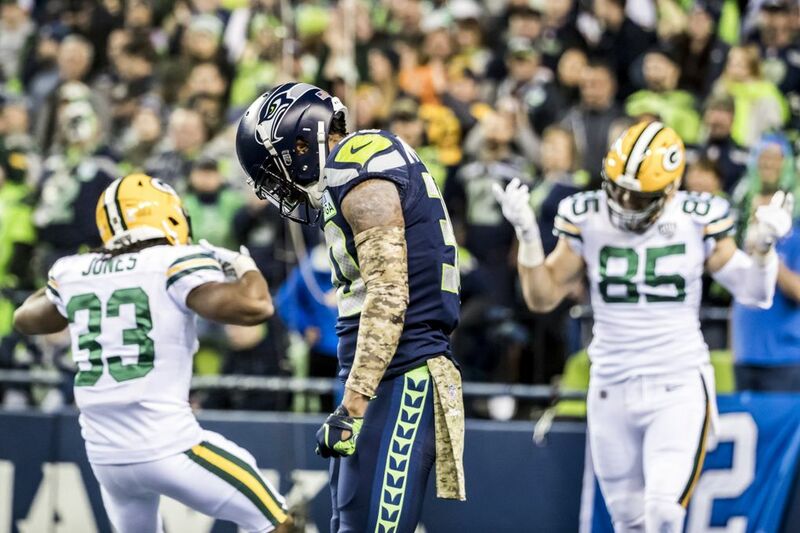 8:57 | Packers 21, Seahawks 17 The Seahawks were going to the miss the presence of K.J. Wright. He’s that good of a player. But both Barkevious Mingo and Austin Calitro have really struggled trying to replace him in this game. 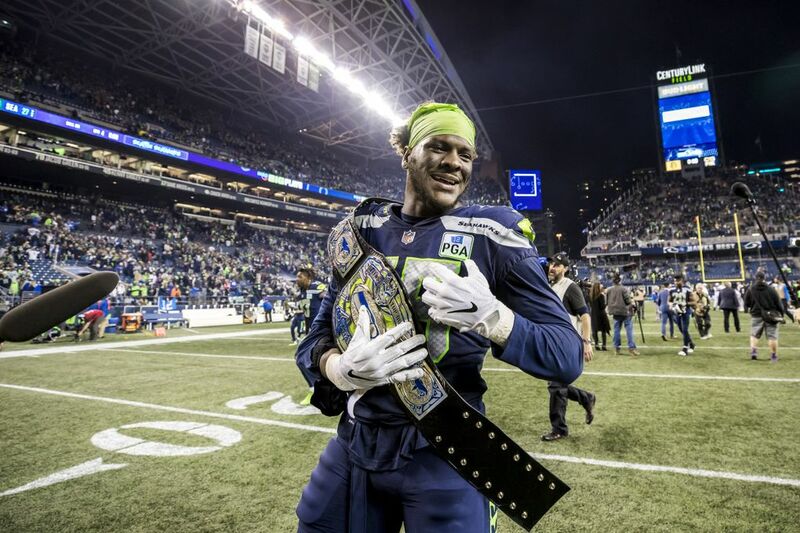 Mingo missed assignment in the first series on defense and then was late getting on the field. Calitro has been marginally better. 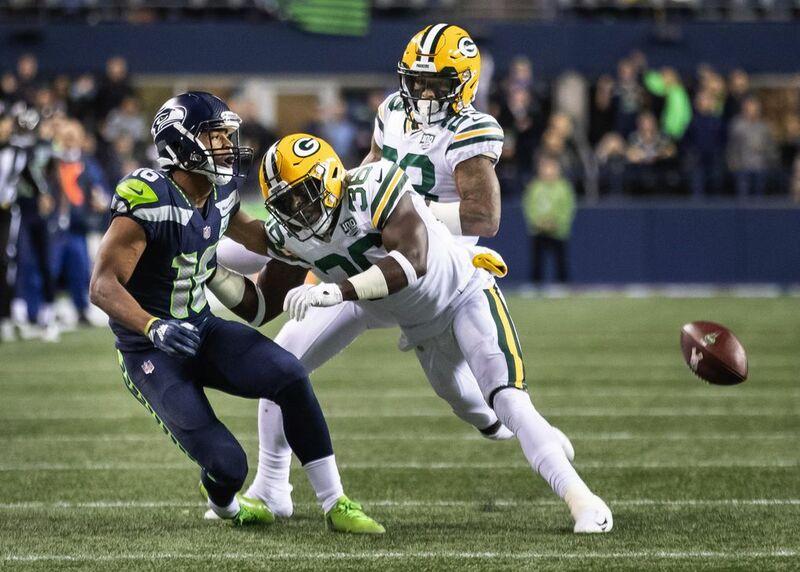 But had missed tackle opportunities on big plays for the Packers. 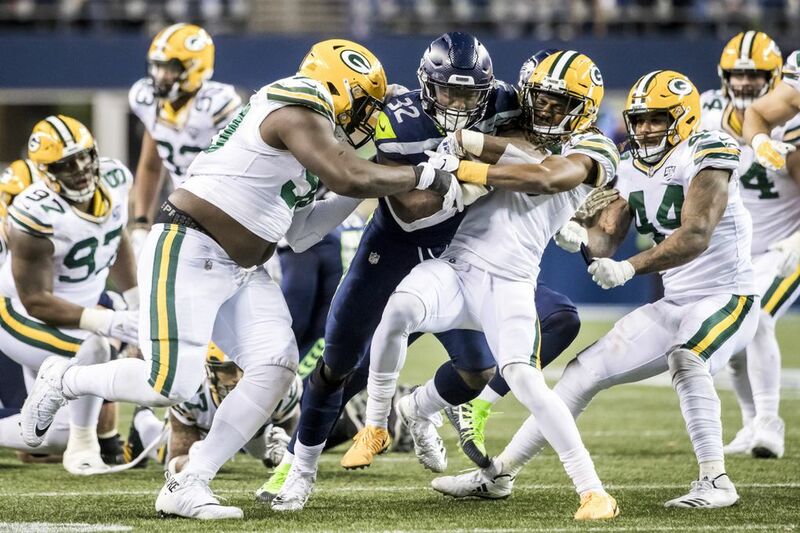 To end the Packers’ drive, it was rookie defensive lineman Jacob Martin coming up with the Seahawks’ second sack of Aaron Rodgers. 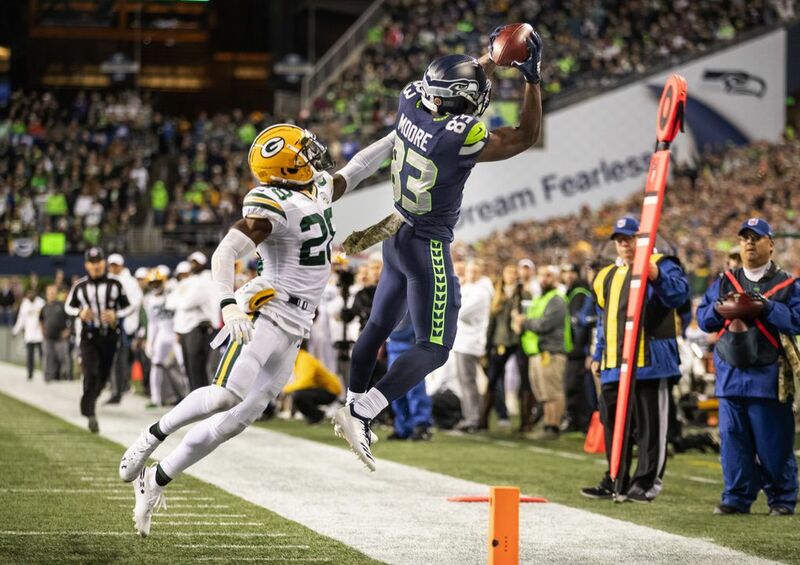 Well, down 21-17 at the half is a heck of a lot better than down 17-3, which is what Seattle could have been at the end of the first quarter. 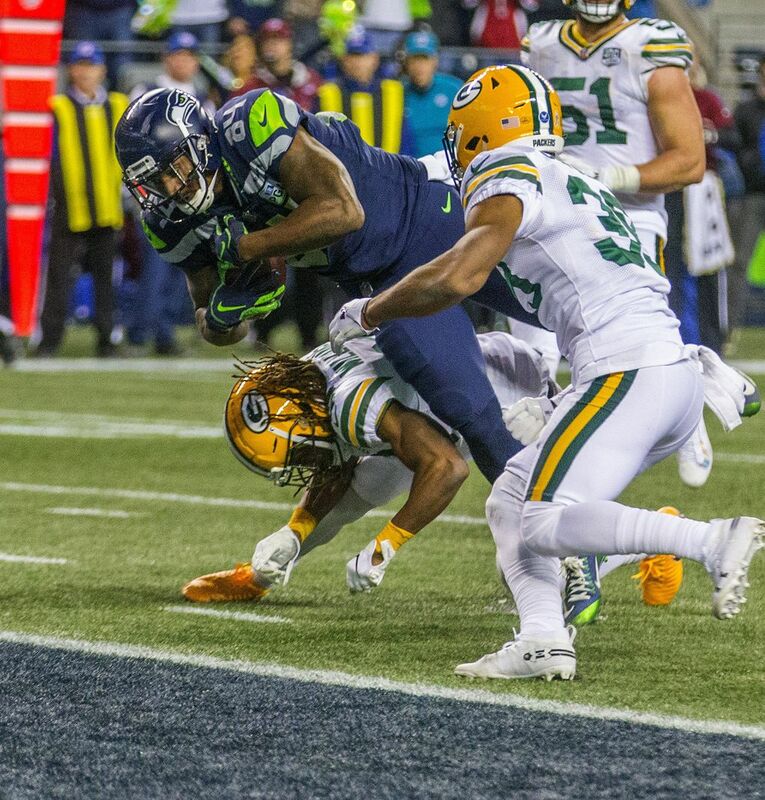 But a Green Bay’s missed field goal and then Seattle getting its offense going in the second quarter has the Seahawks right back in this one. 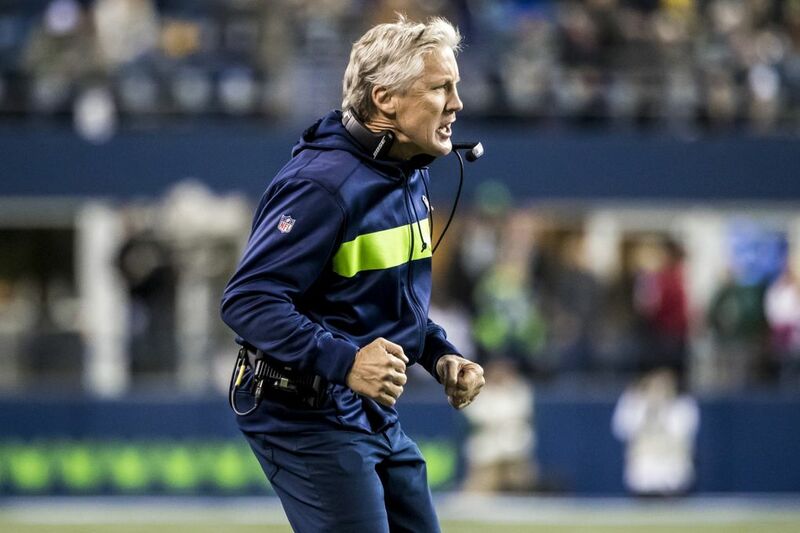 As I noted in my preview today, Seattle has won only one of its four games this year when trailing at halftime — the Seahawks were down 10-7 at Arizona before coming back to win late. Wilson with the bounceback second quarter after the really rough first. 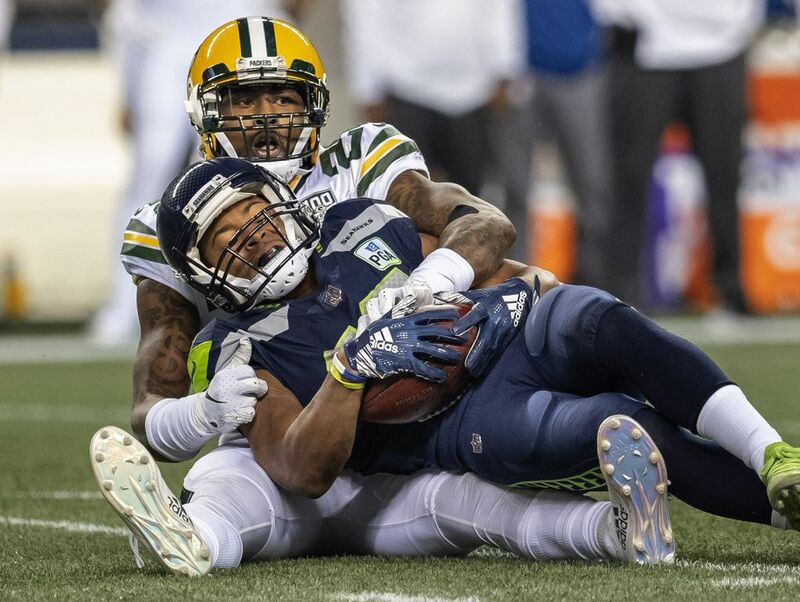 He was 10-11 for 101 yards and a touchdown in the second quarter as well as the throw that resulted in the pass interference and set up the other score. 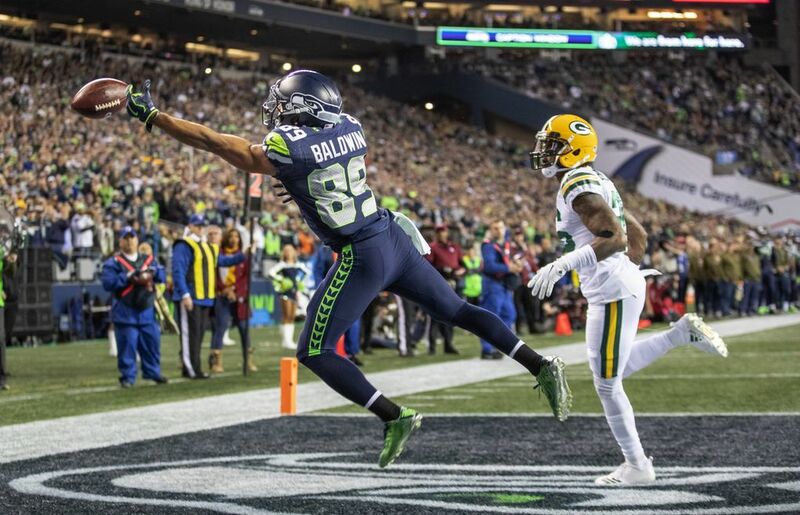 Doug Baldwin is really getting into this game after some quiet moments in recent weeks — he has been targeted eight times and has five receptions for 30 yards and his first touchdown of the season. The targets ties the most he has had for a game all season. 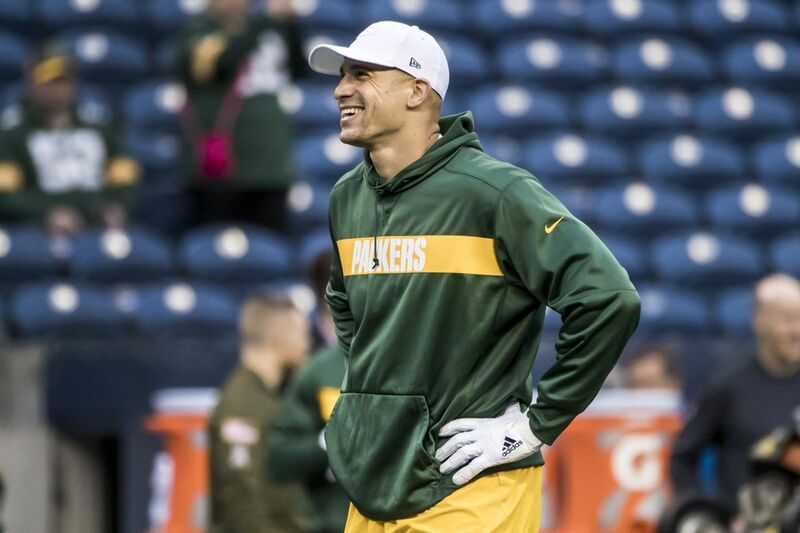 He had eight targets with six receptions against the Raiders in London. 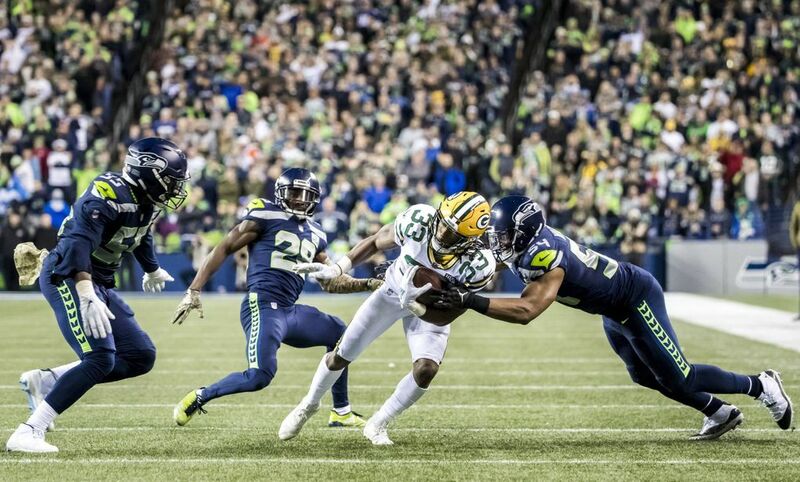 Seattle really has to tighten up its defense, though, as it has allowed 245 yards. Not sure they can beat Green Bay if the Packers get 490. 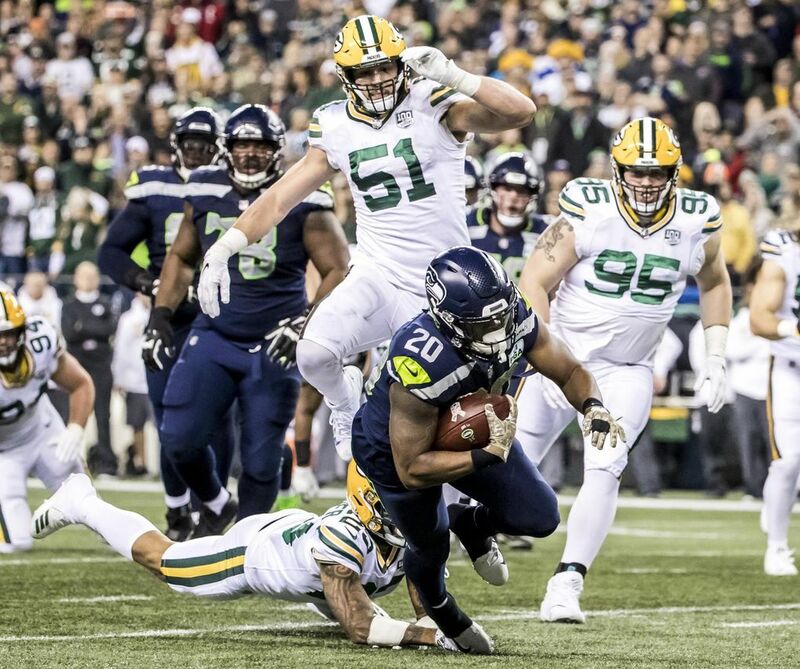 0:02 | Packers 21, Seahawks 17 “Is that for me?” Nick Vannett looked equal parts puzzled and surprised when Russsell Wilson chucked the ball in his general direction on the end of a run at the Green Bay 46. The surprise pass came on the end of an 18-yard Wilson scramble, clearly trying to just make something happened. But he ended up getting penalized for an illegal forward pass. With that … halftime. 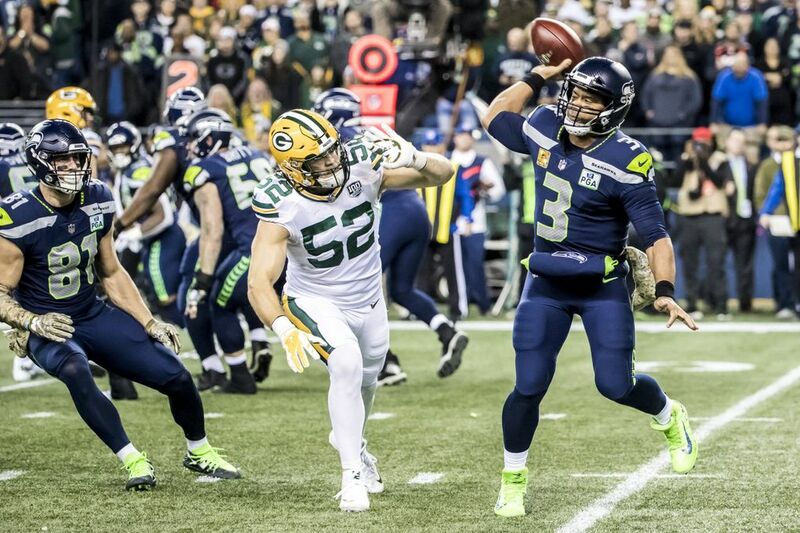 3:22 | Seahawks 17, Packers 14 Russell Wilson can air it out too. 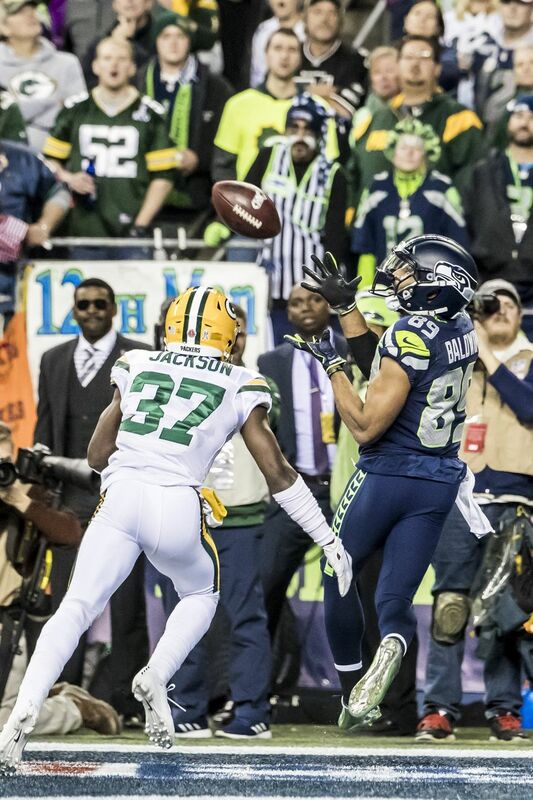 On first and 10 from the Seahawks’ 30, Wilson hucks it for Tyler Lockett who’s racing down the right sideline. Lockett was covered by two defenders and couldn’t quite come up with the catch. 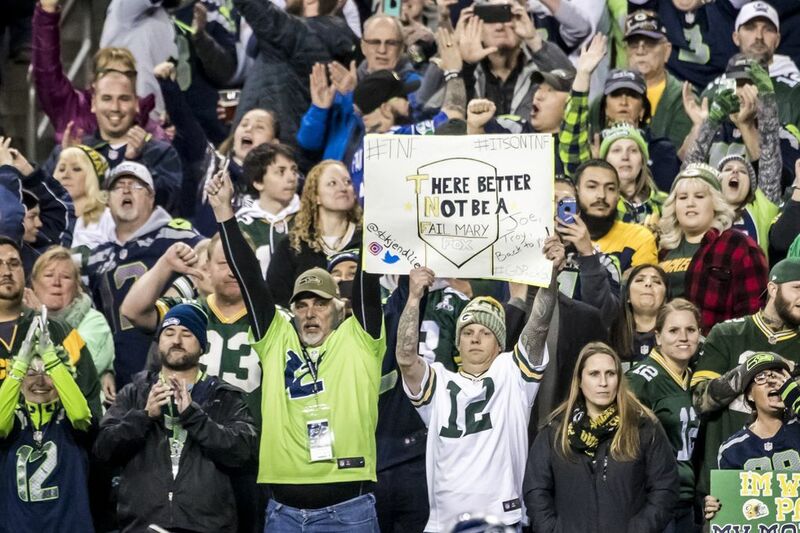 But, oh wait, the flag gets tossed, and a defensive pass interference penalty on Raven Greene gives Seattle the ball at the GB 22. A pass to Nick Vannett takes it to the 1, and Chris Carson runs it in from there. All of a sudden, look who has the lead. 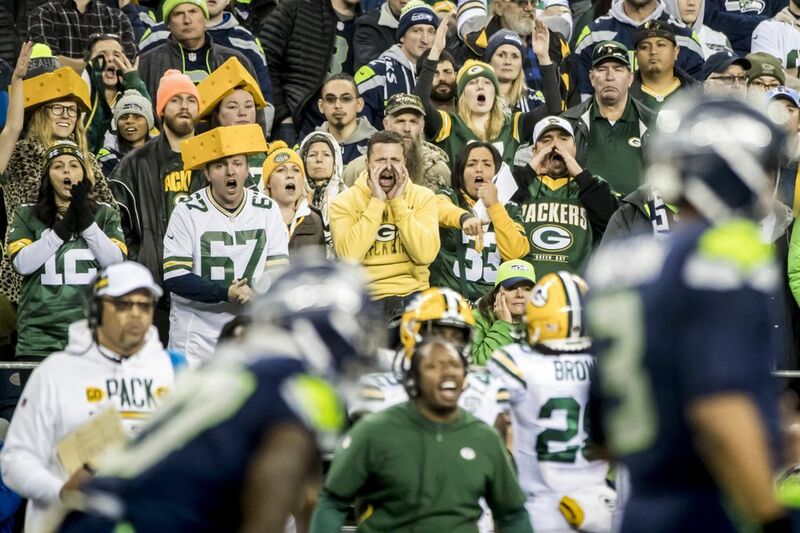 4:54 | Packers 14, Seahawks 10 Ten games. Nine sacks. 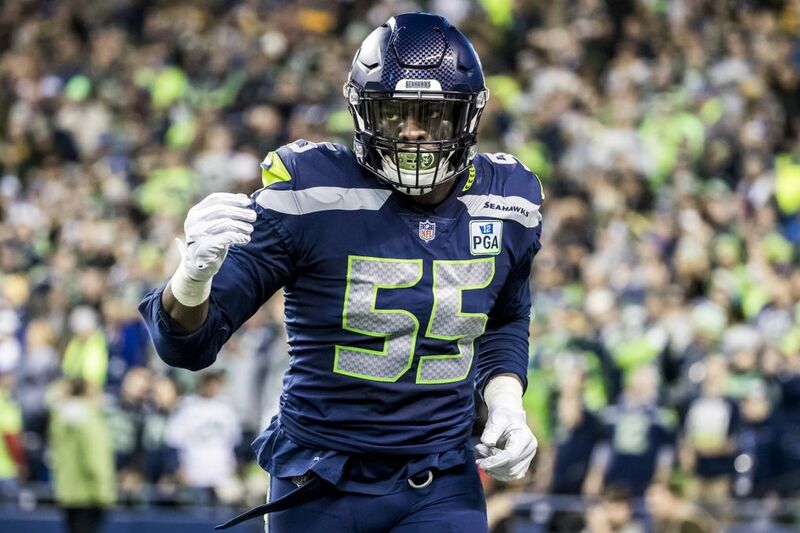 Frank Clark has been plenty consistent this season, claiming at least half a sack in eight of his team’s 10 games. 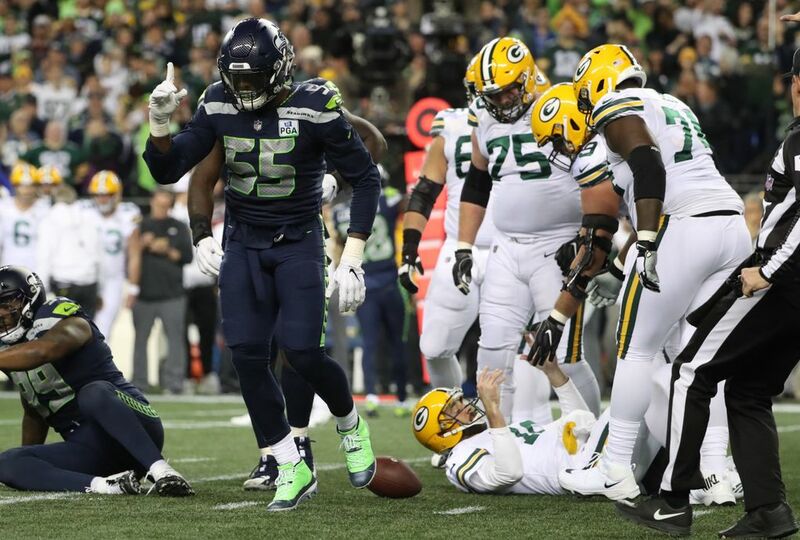 That trend continued on Thursday, when the 25-year-old defensive lineman dragged down Aaron Rodgers to end a Packers drive in the second quarter. Clark has two tackles, one tackle for loss and one sack thus far. 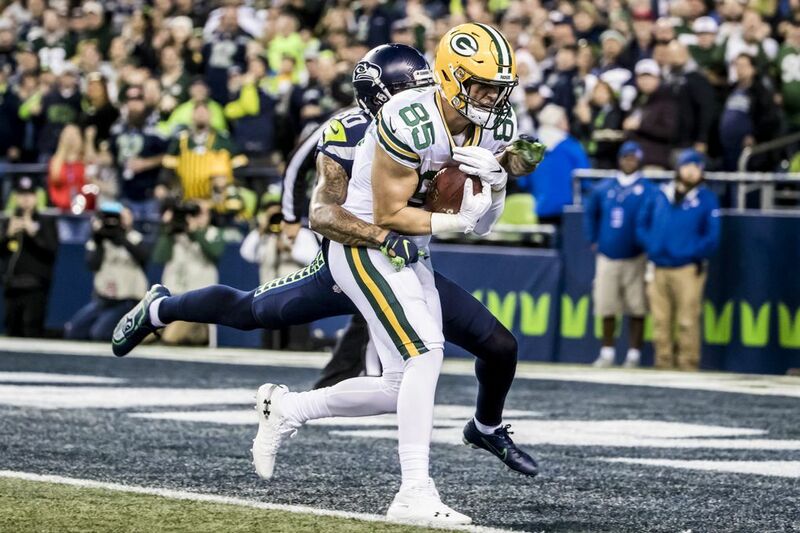 8:04 | Packers 14, Seahawks 10 A drive that just kept going ends in the end zone. 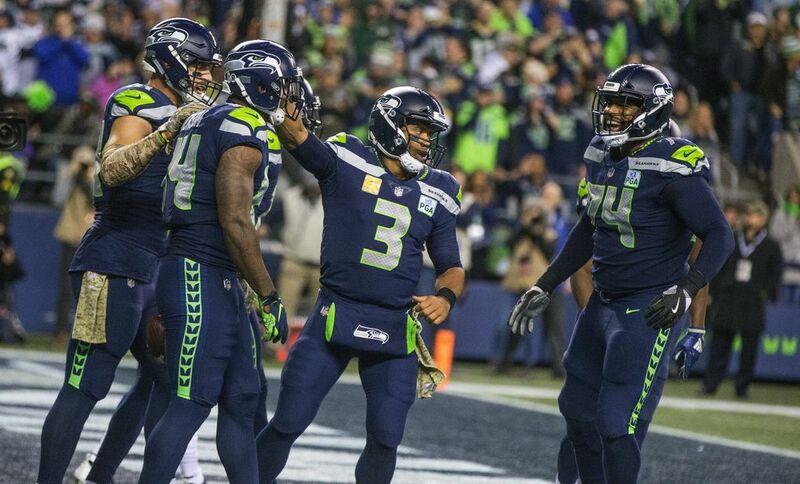 Russell Wilson connects with Doug Baldwin for Seattle’s first TD. And, as customary now, the celebration was even better than the play. There are only so many carries to go around. 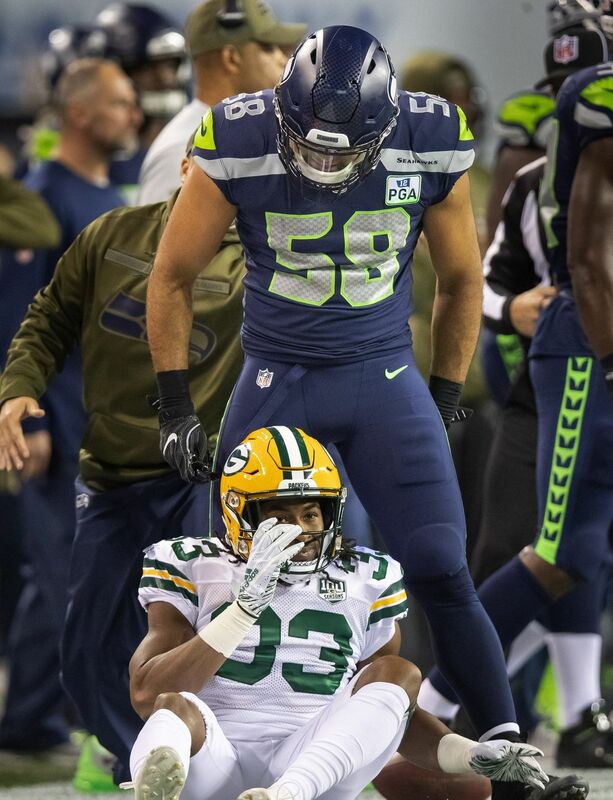 And, midway through the second quarter on Thursday, Mike Davis – the Seahawks’ starter last week against the Rams – has yet to get one. 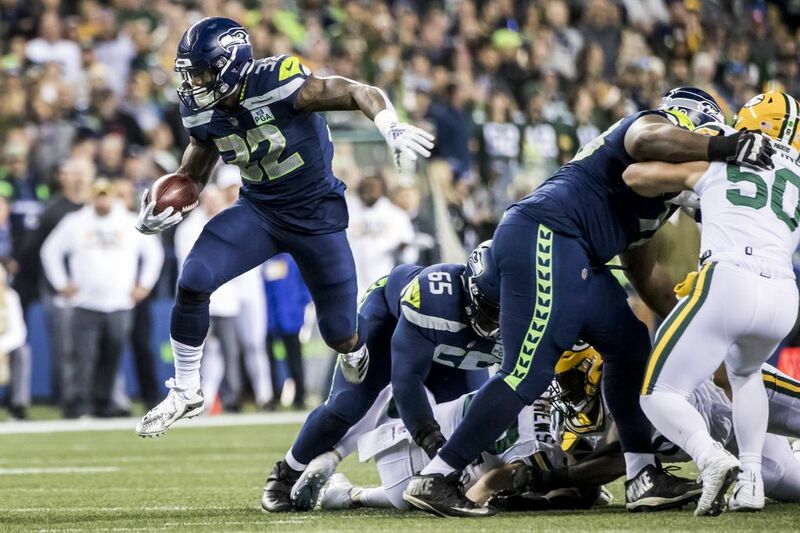 Chris Carson has rushed eight times for 42 yards, while rookie Rashaad Penny has burst for 46 yards on five carries. 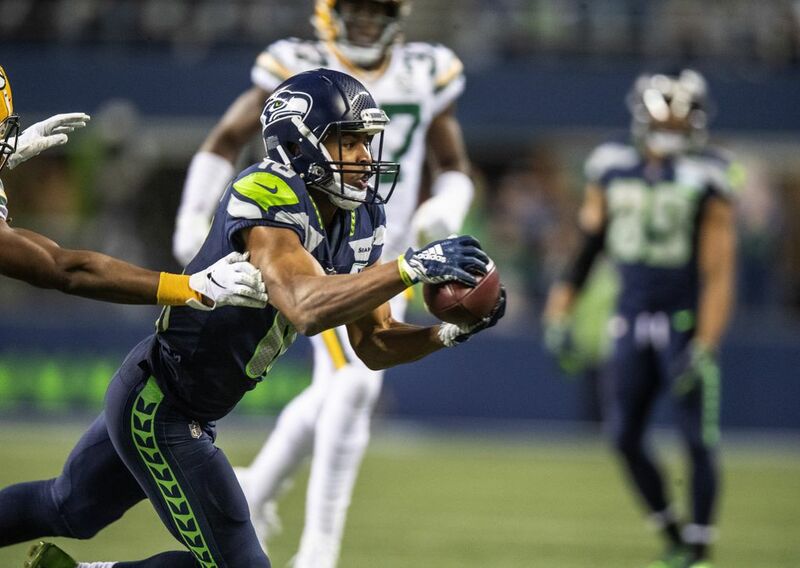 Wide receiver Tyler Lockett has also carried one time for one yard. Without K.J. 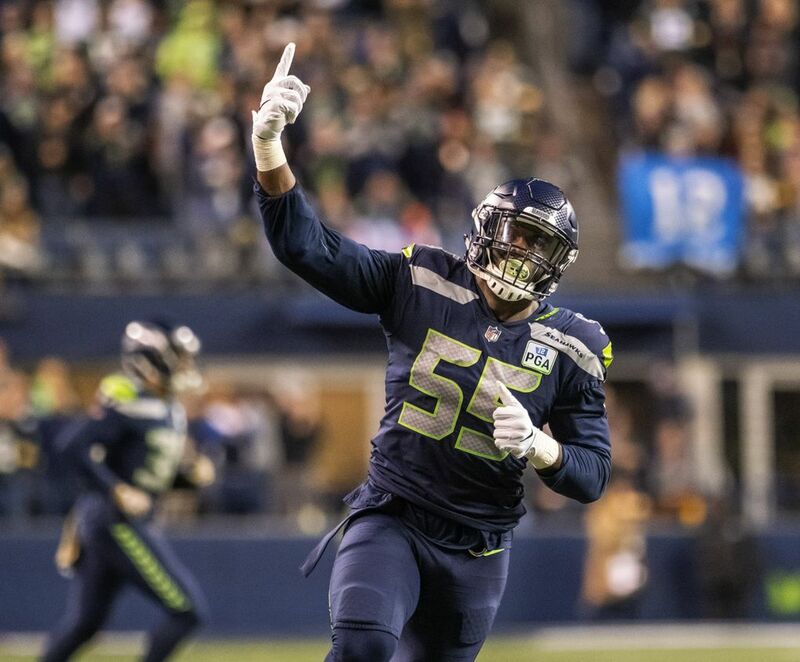 Wright, Seattle is mostly going with a nickel defense and using Bobby Wagner and Barkevious Mingo as the linebackers. But Austin Calitro did get a few snaps in the base defense. 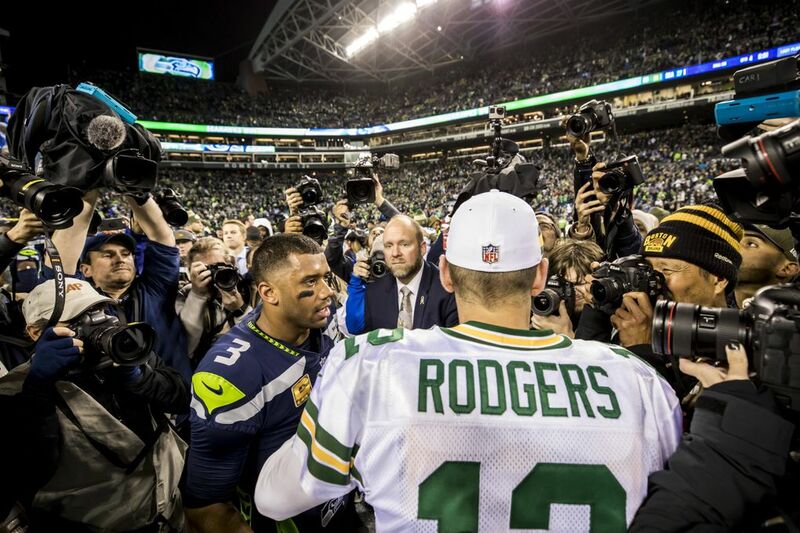 Hey, a bad start for Russell Wilson against Green Bay at home? Feels like we’ve seen that before. 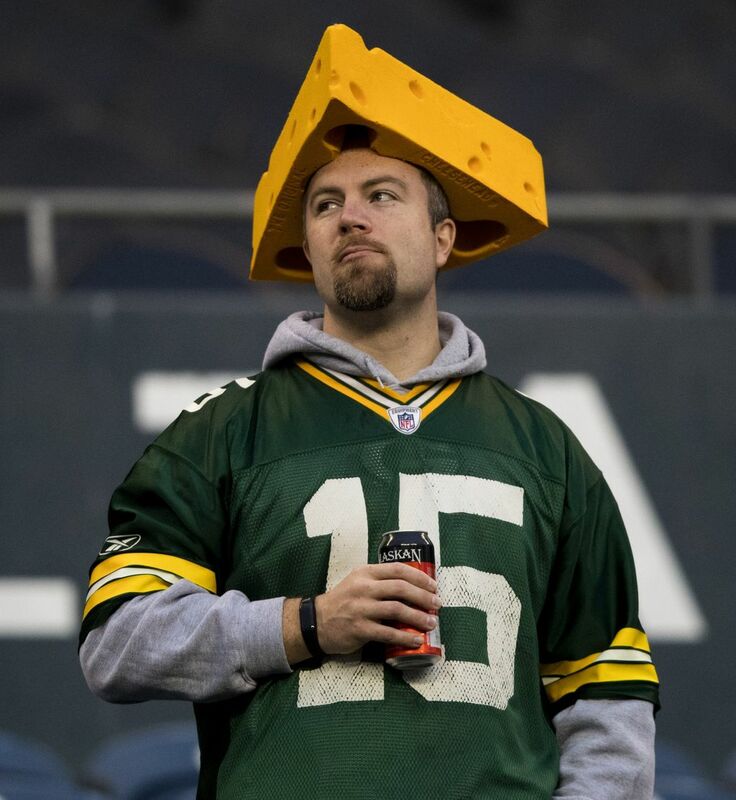 FWIW, Seattle is 3-0 at home against Green Bay in the Wilson era and two featured two of the more memorable comebacks in team history. So maybe there is another one upcoming. 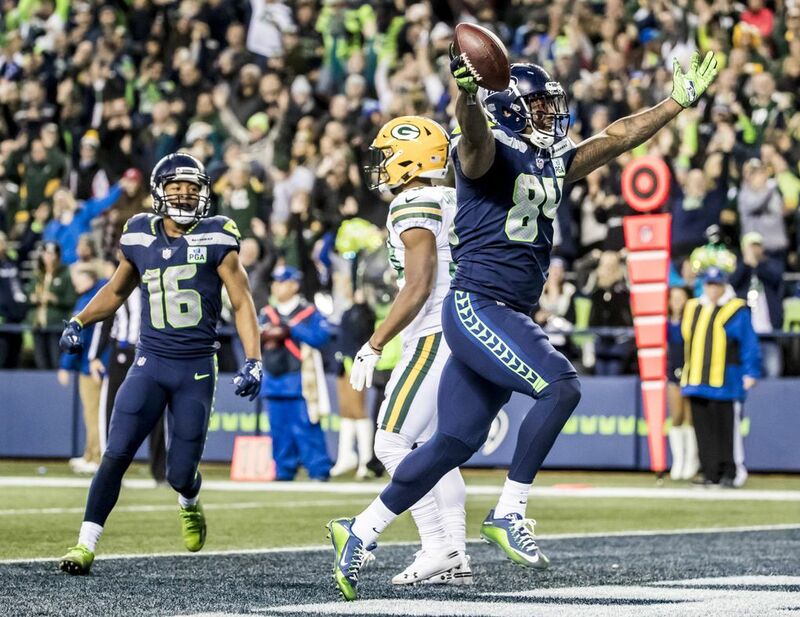 As bad as the first quarter was, Seattle was running the ball well, with 62 yards on eight carries. 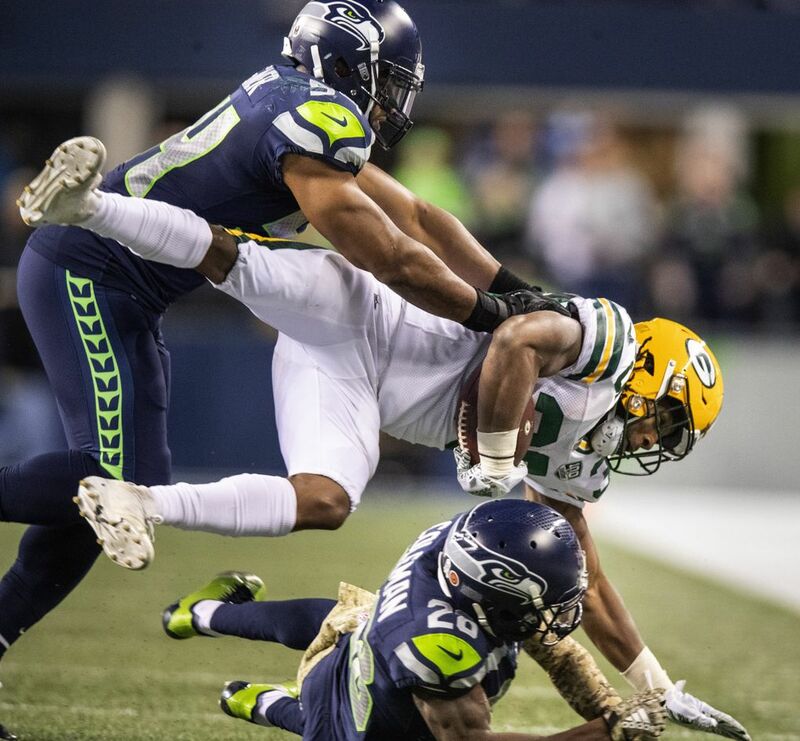 1:45 | Packers 14, Seahawks 3 Rashaad Penny was questionable to return. Then, on the very next series, he returned. 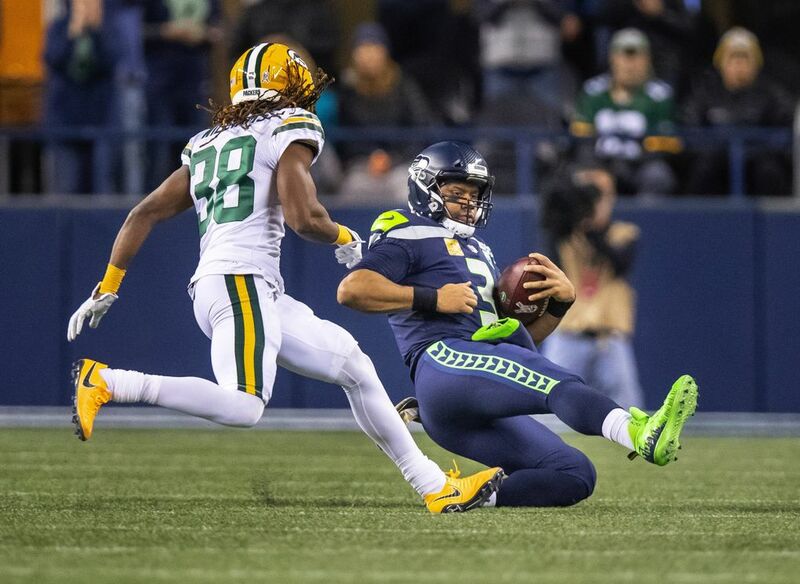 After he appeared to injure his ankle on a weaving 30-yard run in the first quarter, the Seahawks’ rookie running back was back on the field to start the second drive. 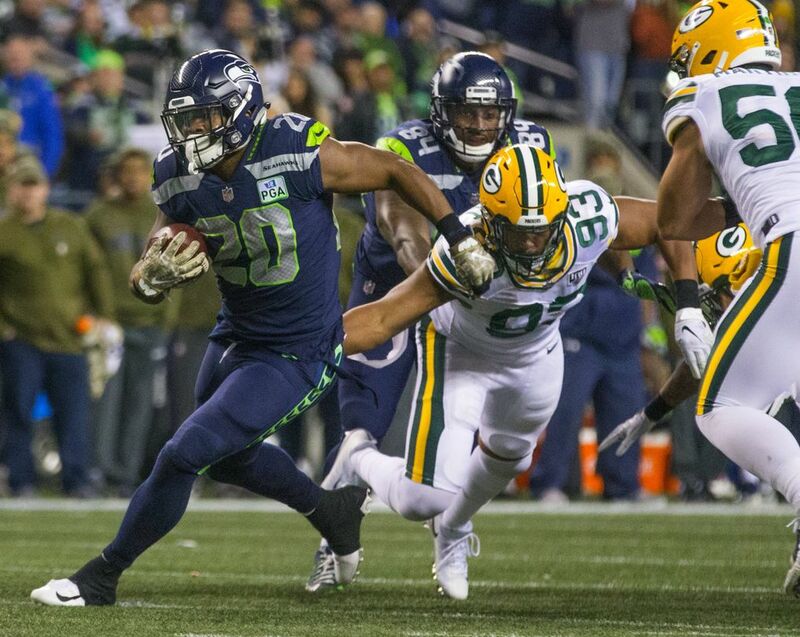 Penny – who rushed for 108 yards against the Rams last Sunday — currently has two carries for 27 yards. 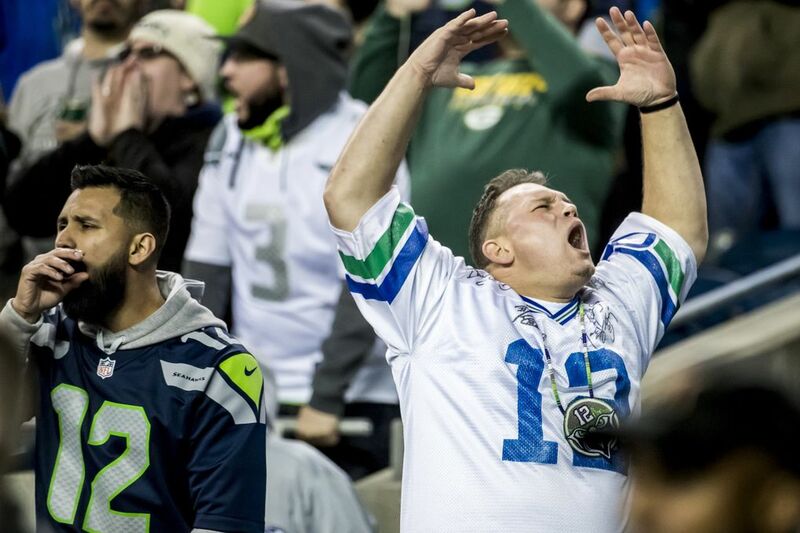 But Seattle goes three-and-out again. That’s two three-and-outs, one turnover and one field goal thus far for the Seahawks. 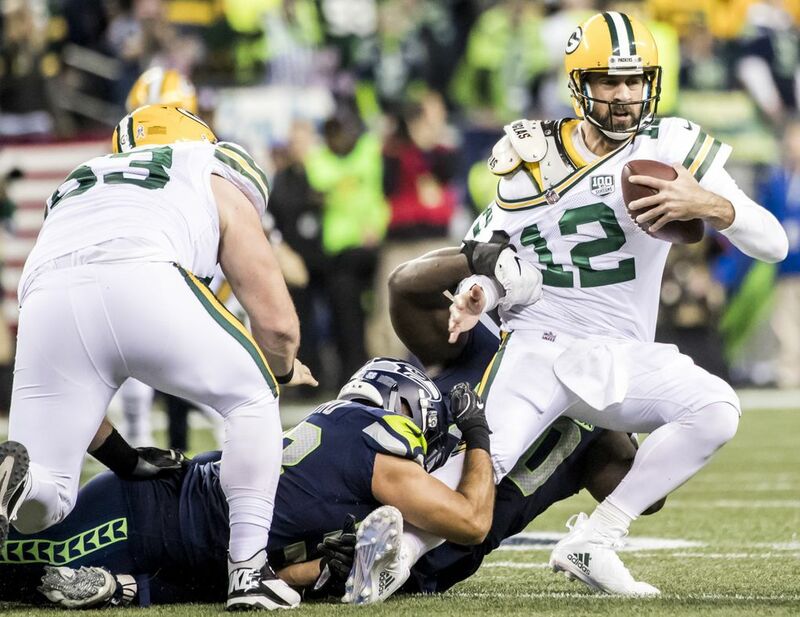 3:21 | Packers 14, Seahawks 3 How good is Aaron Rodgers? 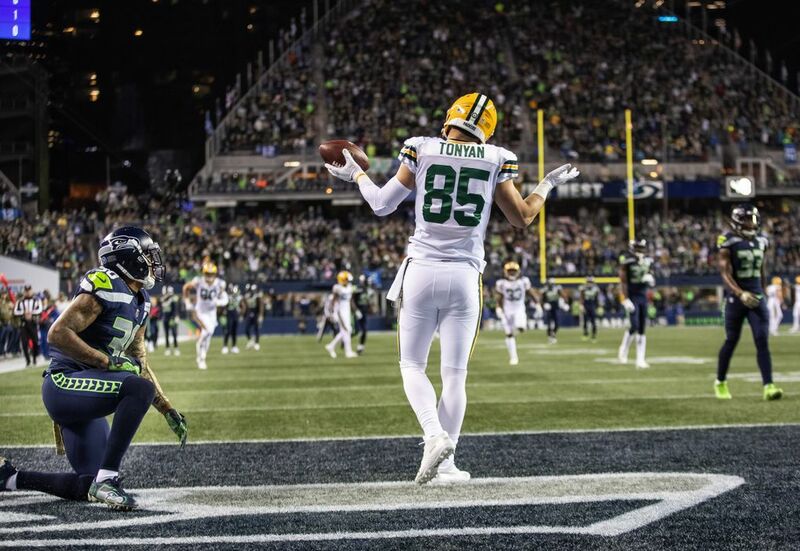 The Packers’ quarterback uncorked a 54-yard pass and hit tight end Robert Tonyan (who? Exactly.) in the end zone over the head of Bradley McDougald. 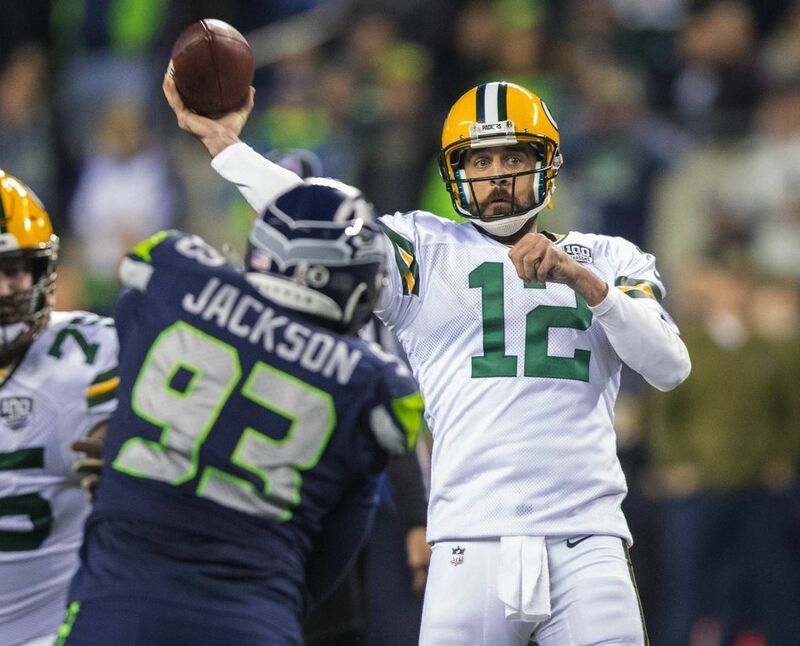 This is why Rodgers is a first-ballot Hall of Famer. 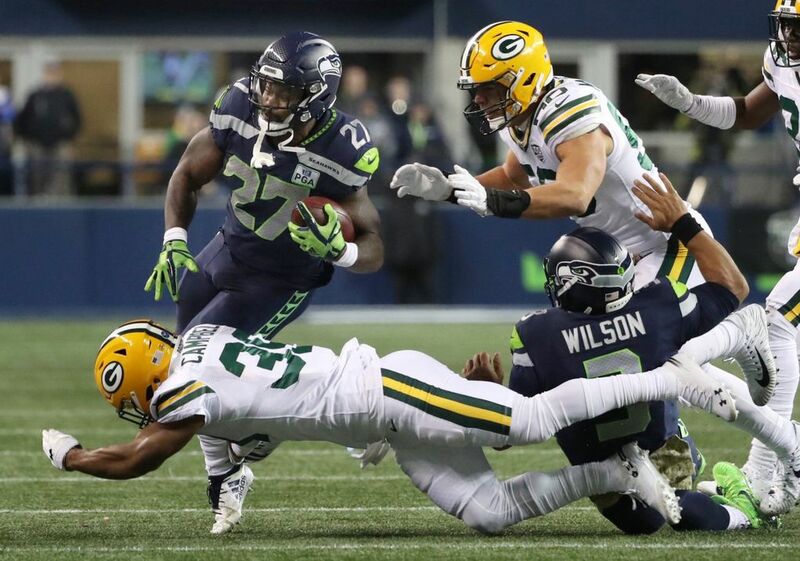 6:04 | Packers 7, Seahawks 3 After Mason Crosby misses a chance to extend the Packers’ lead to 10, the Seahawks take over and Rashaad Penny runs roughshod … for a play. He goes all over the field to pick up 30 yards but comes up gimpy and is questionable to return. The Seahawks can’t get in the end zone and settle for a Sebastian Janikowski field goal. 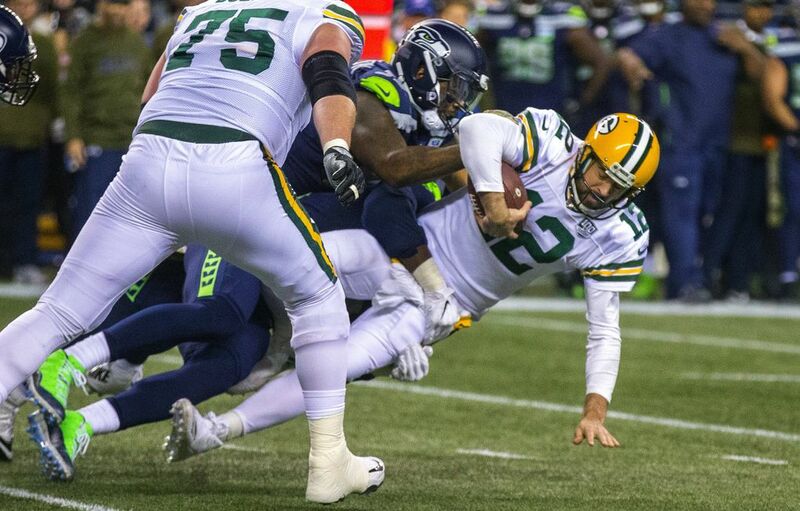 13:46 | Packers 7, Seahawks 0 Well, the Seahawks have certainly had better starts to a game. Worse? Debatable. 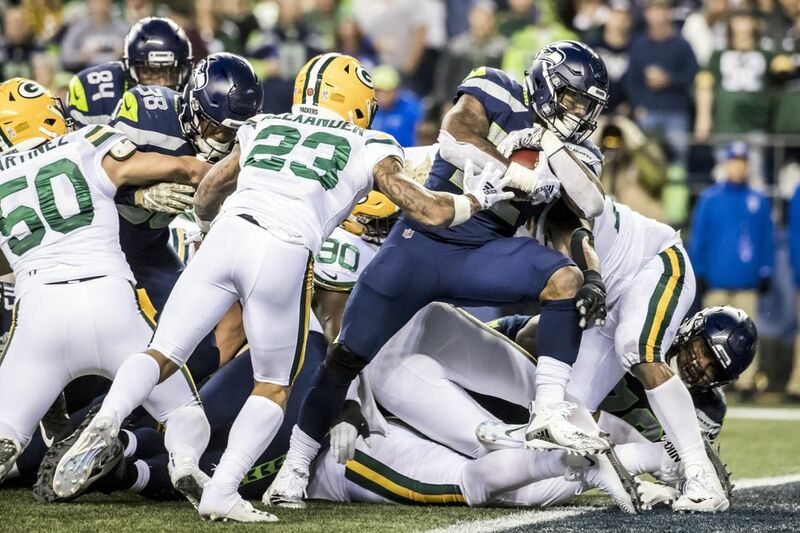 Chris Carson fumbles the first carry of the game. 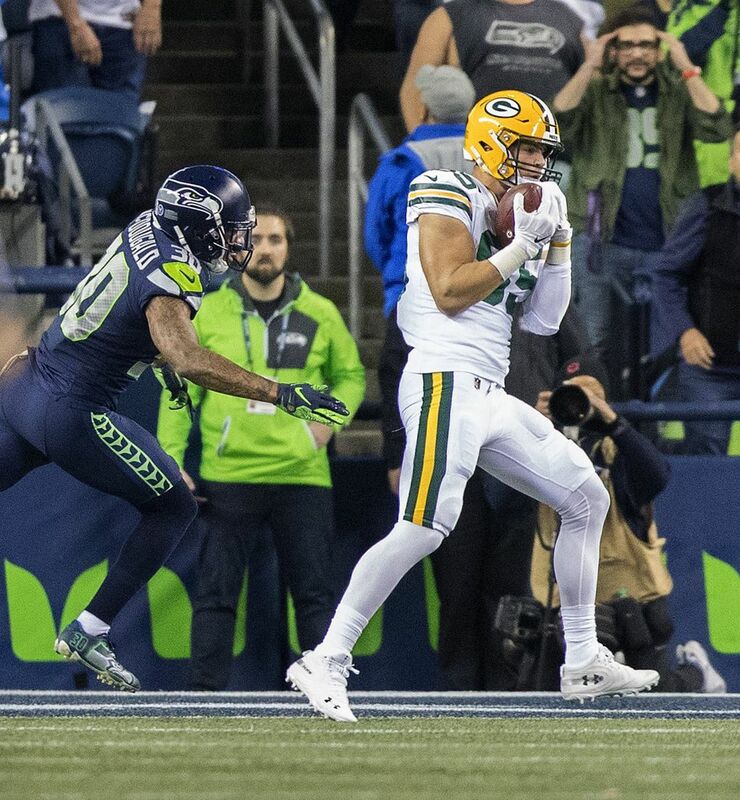 After Green Bay recovers, Aaron Rodgers makes his first pass to Jimmy Graham (in his return to Seattle), and two plays later Aaron Jones rushes eight yards into the end zone. 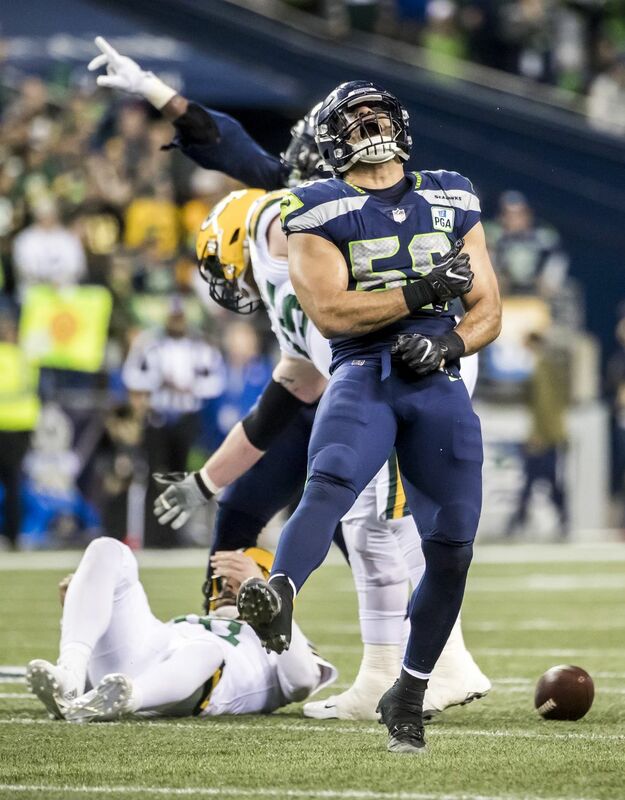 Veteran linebacker K.J. 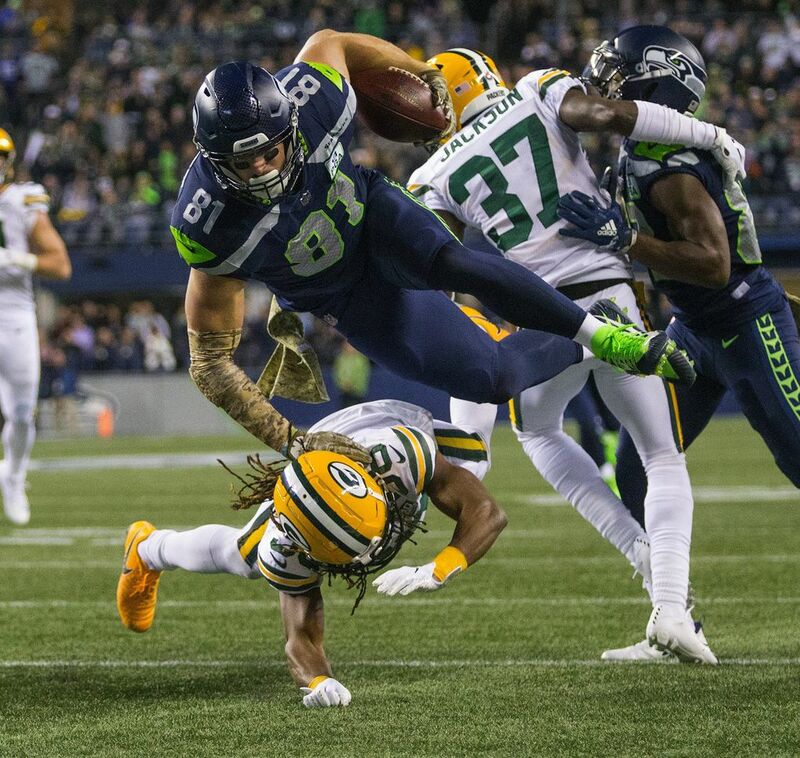 Wright was one of Seattle’s seven inactive players, continuing to struggle with soreness in a knee that he had surgically repaired in August. Wright returned in week seven and played in three games but could not finish last week against the Rams and did not practice this week. Other inactives included defensive end Dion Jordan, who was listed as questionable with a knee issue. 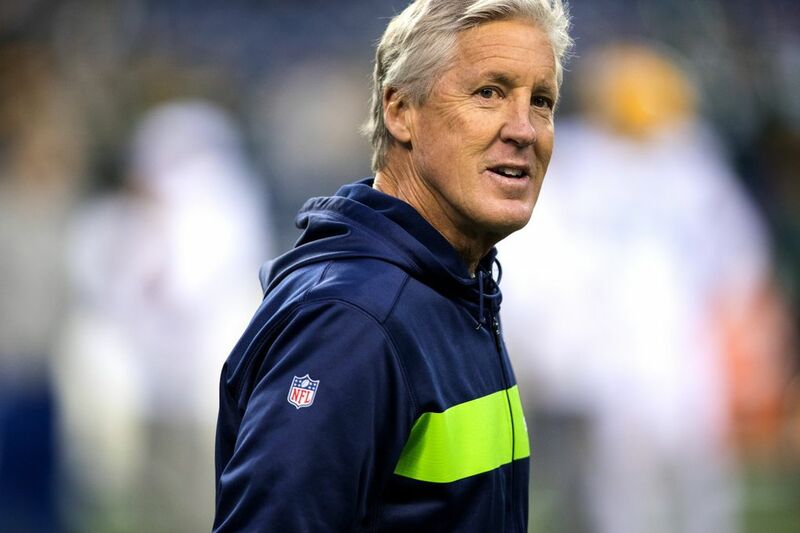 Coach Pete Carroll had indicated he had a chance to play against the Packers but with the short week and then the mini-bye this weekend Seattle also wanted to play it cautious. Jordan has played in seven games this season, inactive due to health in three others. Other inactives were: RB C.J. Prosise, cornerback Neiko Thorpe, safety Delano Hill, OL Ethan Pocic and defensive tackle Poona Ford. 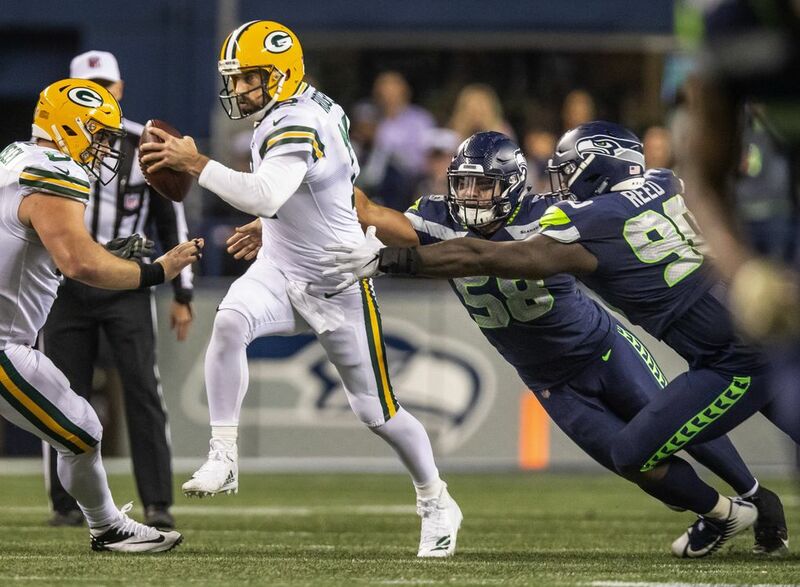 Ford being inactive means Seattle is going instead with Nazair Jones as its backup defensive tackle while Pocic being inactive means Seattle is going with Jordan Simmons as a backup guard. Pocic, a second-round pick out of LSU last year, has played in just five games this season. 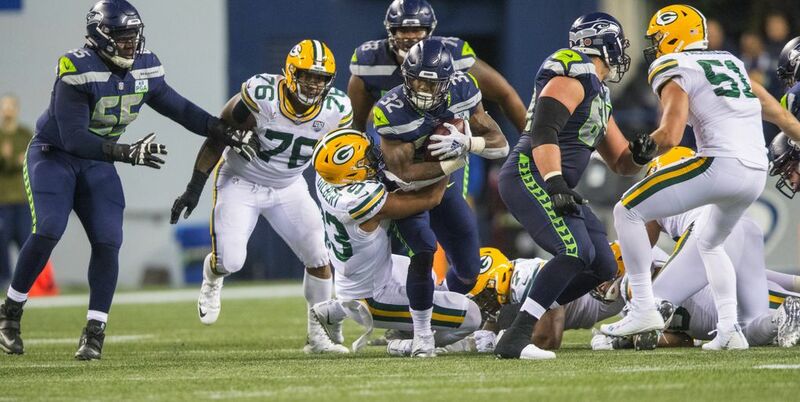 Prosise was active last week when Chris Carson was sidelined. But with Carson again healthy, Seattle is going with its usual three tailbacks of Carson, Mike Davis and Rashaad Penny. 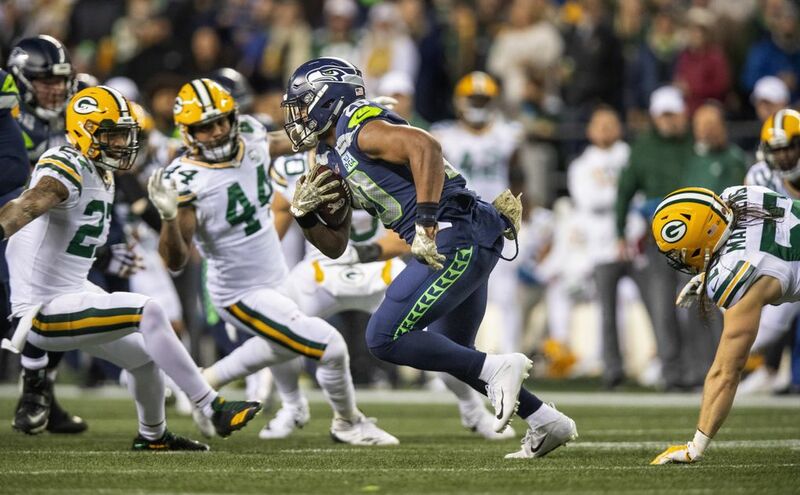 Prosise, a third-round pick in 2012, has also played in just five games this season. Thorpe (groin) and Hill (quad) were each limited in practice this week. 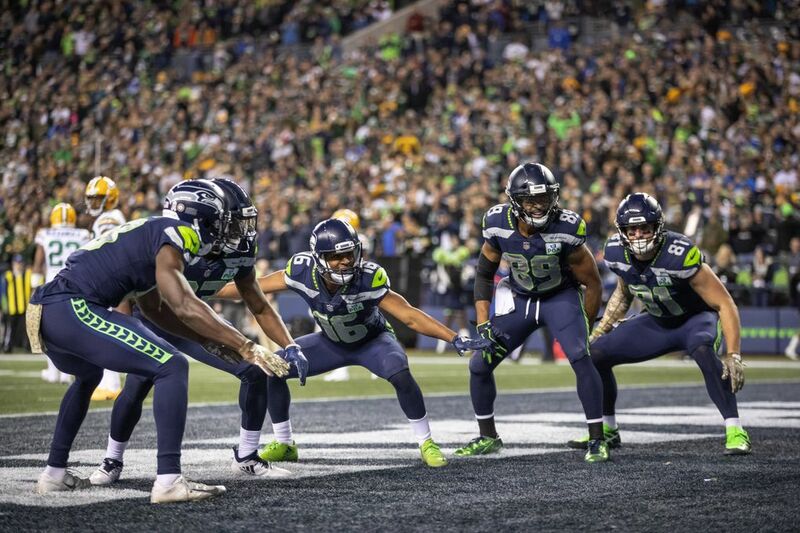 Hill being inactive means Seattle will have to go with Shalom Luani and/or Maurice Alexander as backup safeties.